“You’re listening to UConn baseball on 91.7”, I heard this when I walked under the tent that was positioned behind the back stop, I was looking for a story for my third day and the first 2 stories were easily found and I was hoping that the 3rd would present itself quickly, I was running a little late for the game between Indiana State and UConn so I was hoping I didn’t jinx myself. When I noticed the broadcasters from UConn I thought they were quite young and that they had to be students. I set my lawn chair up behind them under the media tent, I did have a “Press Pass” for the Snowbird Baseball Classic and I was going to use it, I felt important. I went up to them between innings and gave them my card, I said I wanted to talk to them after the game which was currently going into the bottom of the 3rd inning, they both looked at me like, “okay dude”, shrugged their shoulders and went back to broadcasting, I was nervous choosing these 2 because I had to wait to the end of the game to interview them and I didn’t know how much time they had and my goal is a story a day during this trip and I wanted interesting stories and these guys were interesting to me. Plus they could just say they didn’t feel comfortable doing it. As the game ended and UConn lost to Indiana State 3-0, I went over and introduced myself and explained what I was doing regarding Baseball Buddha; they introduced themselves as Chris and Jeff. Chris is the head of the sports department at UConn for the radio station and has been calling UConn Baseball since he was a freshman, Chris is currently a senior majoring in Journalism with a minor in business. According to Jeff, Chris is the “baseball guy” at the radio station, he did every game last year and is doing the same thing for this season and he also decides who covers what sports and who goes on what trips. Don Orsillo who is the play-by-play announcer for Boston Red Sox games on the New England Sports Network has been a big influence, of late, to Chris along with Gus Johnson (see below). Jeff who is only a freshman, is a double major in Journalism and Communications, while growing up in East Lyme, Connecticut, he enjoyed listening to Gus Johnson and was a major influence on why he wanted to get into broadcasting. Johnson is known primarily for his enthusiasm and excitement that he shares with the game. He often uses signature phrases “Oh my goodness!”, “Rise and fire… Count it!”, “Here comes the pain!”, “From the parking lot!”. For those that don’t know who Gus Johnson is and want to know more click here, http://en.wikipedia.org/wiki/Gus_Johnson_(sportscaster). Both Chris and Jeff come from very supportive families of 4, their parents try to listen to the games they call when they are able to, Chris grew up in Crystal Lake, Illinois, where he cheered on the Chicago Cubs, he obviously knows what it is like to be a hard luck fan, I forgot to ask him about Steve Bartman… Jeff on the other hand is a Boston Red Sox fan and since he is only about 19 has no idea what it was like to cheer for Boston prior to 2004 and the “Curse of the Bambino”, but I am sure if you ask his parents about the Bill Buckner error in the 1986 World Series, they will give him a long dissertation. They are very lucky to be able to cheer on their favorite MLB teams in the 2 most historic stadiums, of course that is my opinion but I am sure they will agree. On the broadcast I observed them doing, they were very professional neither one cracked any jokes or said anything that they’d take back. Usually their broadcasts go smoothly without any errors, and they try to stay loose and have fun on the air as much as they can. It comes down to preparation they say, which usually takes about 2 hours (give or take). Names for players on UConn are easier to get down because they’re more familiar with them and see them play more often, but as the game goes on they usually are able to figure out and consistently get opposing team players names right as well. I asked if there were ever times where they just blank out and don’t know what to say, “Sometimes there are moments when we don’t talk on purpose, especially if we want the crowd’s reaction to carry over across the airwaves. Even though it’s going out to a lot of people, we feel like at the game we’re basically having a simple conversation between two people and that makes it much easier to share our thoughts and such on the broadcast,” Jeff stated this in his very relaxed and unassuming manner that I really admired for being so young. I was curious about the stats they used for the games and I was surprised that they had to keep their own for baseball. According to Chris it is important because they need to write down things for every pitch, there are game note packets and things online that schools put together that have all of the historical data in them, and that’s what they look at when they do their preparation. As I watched them they were checking things on-line and seamlessly working those facts into the game. Both call other sports for the school radio station and they say that it doesn’t take away from school or the social aspects too much. They say that if they could continue their careers; working for one of the big networks would be the dream. Jeff says that he is shooting for ESPN, NBC, CBS, or whoever will take him. As long as he can continue to do this as a job and do it for the rest of his life that’s all that really matters. If he could cover either basketball, football, or baseball professionally that would be fantastic. Chris and Jeff call the games on 91.7 FM which is UConn’s student radio station, and if you would like to tune in, a lot of people stream them online at whus.org, I enjoyed listening to these 2 guys and I believe that they will go far in the broadcast business. If you enjoy this story and you would like to help me complete the “Baseball in America Tour 2014” which is roughly 265 days, please click on the following link to see how you can help http://www.baseballbuddha.com/sponsor.html. Please also share this on your Facebook page and Twitter, I appreciate all the help I can get! Fans and commentators, too. 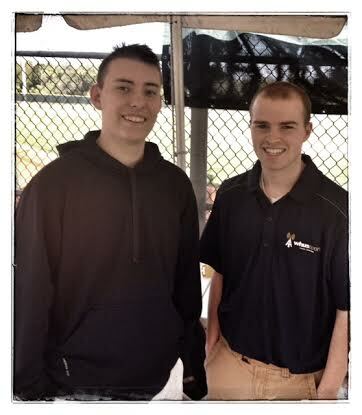 Could be two young aspiring broadcasters in our future…or at least for those on the East coast. They have a goal, do their homework in a field, obviously they both love – sports. A very important aspect of our games. I like the fact that they are learning – the best coverage is of both teams … not just their favorite. Great piece, John. nice story knew you could do it!!!! !